“Industry 4.0 is really the ecosystem that is a smart factory. It takes all of the systems in a factory, ties them together to help not only those who manage the process, but also to help the employees on the factory floor become more informed on the health of the system,” said Andrew Storm, Eckhart’s CEO. 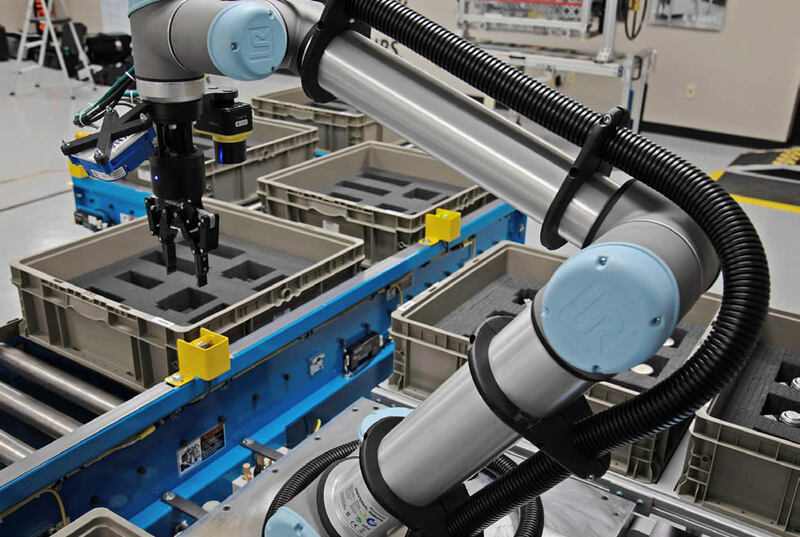 Eckhart customizes factory floor solutions to address specific needs of each client, walking the floor to see exactly where ergonomics, line of site or bill of materials can be improved using autonomous guided vehicles, collaborative robotics and additive manufacturing. When working to streamline production for their leading industry clients, from Ford to Mercedes to Airbus, Eckhart has shown how additive manufacturing with Stratasys materials greatly improves the way things have always been done. “Traditionally, we had to design our parts around the way we were going to manufacture them, whether it was manually machining or CNC machine, our part design was limited to our manufacturing capabilities,” said Heath. “But with additive manufacturing, the complexities and capabilities are limitless. ”Many of Eckhart’s clients have seen great benefit from small tweaks to their processes, adopting 3D printed jigs and/or fixtures for applications such as a lug nut starter, badge alignment tools and wiper alignment set fixtures. “Pressing on badges, emblems on vehicles – these things are repetitive tasks. When we go into plants and we pick up a badge tool, and it’s heavy, it’s either above or right at that ergonomic limit for the operator to be able to pick up 60 times an hour. So we’re alleviating the repetitive injury strain on the operator,” explained Heath. Eckhart recognizes time and innovation are top priorities, and all businesses are under an extreme amount of pressure to iterate faster. Eckhart sees this across the board, from heavy truck manufacturers like Caterpillar to medical device manufacturers Medtronic and Boston Scientific, to aerospace manufacturers Boeing, Airbus and Lockheed Martin.